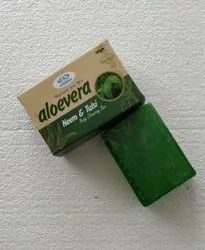 Neem and Aloe vera Herbal Soap has a property to soothe & heal dry, damaged or sensitive skin, skin rashes & irritation. 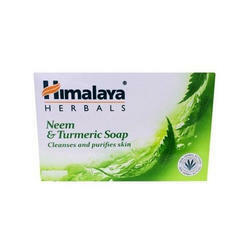 Neem is a natural antiseptic and Aloe Vera which is a natural skin moisturizer & conditioner which revitalizes the skin. The soap acts as an antibacterial, clearing up skin rashes, acne and eczema. It also soothes backaches and relieves tension and stress from the muscles. We offer to our clients neem based soaps which come enriched with pure neem oil & coconut oil. It helps in keeping the skin silky and soft and acts a s a strong antibacterial agent during humid conditions. we are offering wide range of Anti Bacterial and Fungal Soap. Available in different packaging sizes, the offered Margo Neem Soap is vastly known for its enhanced shelf life, correct composition and effectiveness. Taashi Neem and Tulsi bathing bars are hand made soaps made with finest quality ingredients, amazing fragrances and extracts. Neem and Tulsi oil gives antibacterial effect, fresh feel to skin, soften the skin, nourishes and revitalise the skin. For all skin type. Allow this natural healer to take you on a ride to , where you will find health, beauty and skin hydration on the way and to give any type of skin a transformed appearance.